Is it the DNC or a donut convention? Sorry, I couldn’t resist that joke. The DNC spared no expense when it comes to security. There’s police and sheriff deputies from all over. They’re easily the most prominent aspect of the convention (besides the road closures). 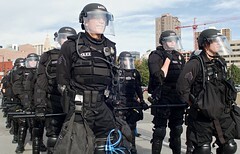 Riot gear from top to bottom. Man and horse alike with face shields and body armor. Armored vehicles, tactical SUVs and cop cars everywhere. The sirens are almost constant. The news reports filled with stories of reporters being arrested and protesters being abused. I figured on some reports of police brutality but it has been less than I expected. I do have to commend the organizers, though. They’ve managed to somehow keep all the ruckus off to the east of the convention and the Pepsi Center. Mostly around Civic Center Park. There’s been a few marches up Speer but that’s about it. Down and around the Pepsi Center there’s a lot of sirens and a constant stream of helicopters but otherwise its just lots of people going about their business. Little hassle, mostly just crowded. Older Stop moving my iPhone icons!